The File is considered a type of content. Please review Adding Content for a full explanation of how content is added in various places throughout Project Insight. 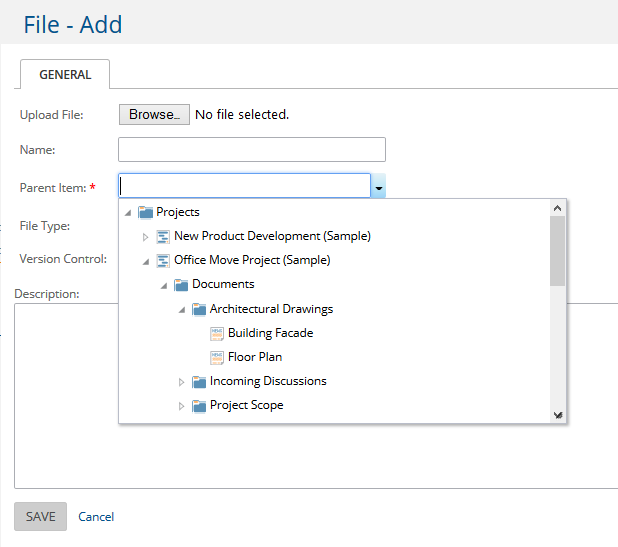 Files can be uploaded to Project Insight from various places using the add icon . Upload File allows you to browse to the location of the file and select it. Name is for recording the official name of the file. The name does default to the name of the source file, but can be changed. Parent Item allows for selecting where the file will be kept. File Type allows you to select the type of file you are uploading. Version Control forces the storage of each new uploaded file as a separate file for a complete update audit trail. Version control cannot be removed once it is selected. If it is no longer desired, download the file and upload it again as a new file without the version control option selected. Description offers a text window to type in as much descriptive text about the file as necessary. Text and keywords entered here will be used when performing a site search for this file, a very helpful feature when managing graphic files. Editing of the Name, File Type, Description and a new field called Comments can be made without changing or deleting the existing file by using the edit icon associated with the file.